Due to the fact that I travel so much, I think it’s probably true to say I’ve opened my trousers next to more urinals than the average guy is likely to have done, but I don’t normally have a big smile on my face when I do so. Last night I went to the Bordello Bar in Bucharest and, as is often the case when drinking beer, my bladder started to feel a little too full so I headed for the WC. Initially, I didn’t take a lot of notice of the picture on the wall in front of me, but as soon as I did I had to smile. I read the words first: “Honey, Let it Go.” Then I realised the bordello girl in the picture was holding a camera and the angle was perfect. The camera in the picture was trained on my… beer recycling machine. If you ever happen to be in Bucharest, I recommend you visit the Bordello Bar. It’s a theme pub, not an actual bordello and it’s a pub in three parts. It consists of the main pub, the Library Bar, and the Mulanruj Dining Theatre. I only went to the main bar. It has a couple of mannequins in the window that are dressed up like the boredello girls you see in westerns and other old movies and the walls in the pub are decorated with murals and pictures of bordello ladies for hire. The Bordello Bar is a fun place to go for a drink or two and although there are bars in Bucarest that are cheaper, the cost of a beer at the Bordello bar is less than it is in many other bars on the same street. 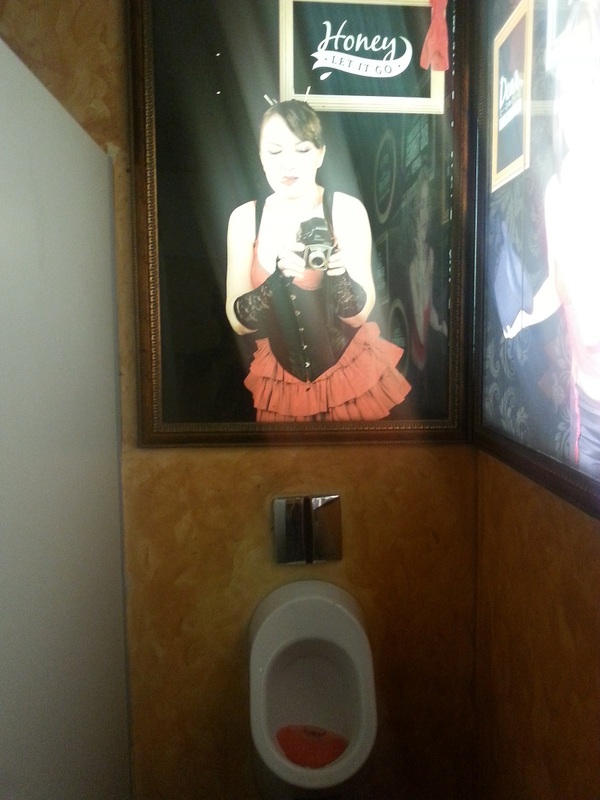 The toilets are on the first floor and all the urinals in the men’s toilet have pictures of bordello girls above them. They are fun pictures that offer silent criticism of the Bordello Bar customers who are busy emptying their bladders. After seeing the pictures in the men’s toilet, I’m kind of curious to know what the set-up is like in the ladies toilet but that’s a mystery that will have to remain unsolved.